Home > Market Commentary	> When Will the U.S. Housing Market Reach Bottom? When Will the U.S. Housing Market Reach Bottom? U.S. homeowners, financial institutions and the entire financial and economic system faces a crisis due to the bursting of the U.S. housing bubble. This crisis is rippling through the economy, resulting in business failures and rising unemployment. Treasury Secretary Henry Paulson stated that the housing correction poses the biggest risk now facing our economy . How this is resolved will set the stage for our country’s economic future . Before August 2007, homeowners were encouraged to take advantage of rapidly-escalating real estate values. Easily-obtained, risky financing enticed many homeowners to extract home equity or take on large mortgages based on low initial payments. Many planned to refinance later or sell to take advantage of increasing home values, never anticipating that the housing bubble might suddenly burst. Rising real estate values created a false sense of security. Homeowners increased spending driven by a “wealth effect” as described by Robert Shiller, co-developer of the Case-Shiller National Home Price Index . Contributing to the housing bubble, government policies aggressively lowered the barriers for home ownership. During the 1990s Washington pushed to expand Fannie Mae’s and Freddie Mac’s role in providing loans for low and middle income borrowers. In 2004, the Republican Party platform stated that the down payment is the “most significant barrier to homeownership.”  When homeowners have less money at stake and can use relatively lower incomes to buy homes, the chance of foreclosure in times of economic adversity increases. This added an element of unanticipated risk to mortgage loans. Unfortunately, ongoing increases in housing values were unsustainable, and have been followed by a decline in value not seen since the Great Depression. The housing “debacle,” as described by Federal Reserve Chairman Ben Bernanke in August 2008, is a “financial storm.” This storm is now buffeting the broader economy, muddying the employment picture and creating a vicious cycle that continues to negatively influence economic and financial conditions . Opinion differs on when the housing price market will hit bottom. Compare the comments of Home Depot CEO Frank Blake (“We are getting awfully close to the bottom”) to those of Credit Suisse economists, who predict the bottom is more than a year away . 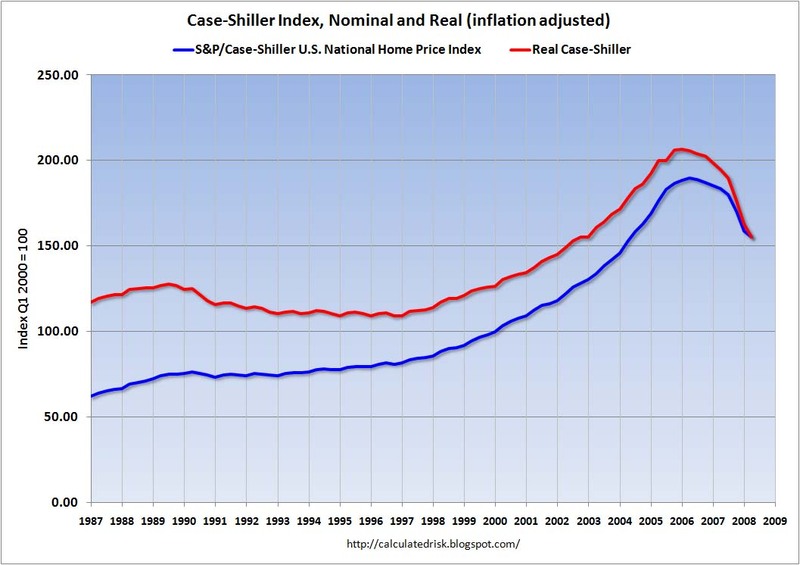 The Case-Shiller National Home price index (and related metrics, e.g., the price to income ratio) imply that house prices still have the potential to fall further before hitting bottom . Uncertainty about when prices will bottom keeps potential buyers on the sidelines, anticipating better prices yet to come. Financing is difficult to obtain, keeping would-be buyers from taking advantage of lower housing prices and reducing homeowners’ options . As home loan losses mount, banks are reluctant to lend –they are requiring larger down payments and are increasing borrowing costs . An even larger wave of Alt-A loan defaults may occur soon. Borrowers have few options when payments jump by 50% and they are unable to sell or refinance their way out. .
Foreclosures have increased at the fastest pace in almost three decades during the second quarter of 2008 . A record 9% of mortgage payments were behind or in foreclosure at the end of June . In July, homes sales increased by 3%. Credit Suisse analysts noted that low prices due to foreclosure sales drove the increases . Housing inventories have jumped significantly. The current supply of houses on the market has increased to 11.2 months. An inventory glut has depressed prices. Builders are struggling to remain in business and jobs losses are growing and spreading to other sectors . The takeover of Fannie Mae and Freddie Mac is an important step. However, the recovery is still at the mercy of the financial storm . The bailout of the GSAs, undertaken to calm markets, attract investors, and reduce mortgage rates, was necessary . Early indications are that the takeover may have the desired effect. Investors are returning, quickly bidding up the price on mortgage-backed securities, which has effectively lowered rates. Rates fell below 6% for a 30-year fixed-rate mortgage within a day. Stabilizing the housing market would boost confidence in the entire economy . With the collapse of Lehman Brothers, succumbing to the subprime mortgage crisis it helped create, the outcome remains uncertain . Recovery is dependent on two factors: an upturn in new house construction and firming prices for existing home sales . An upturn in construction would stimulate the job market, and a rebound in home prices would allow existing homeowners the chance to sell. This in turn would help clear “toxic” loans, restore consumer confidence and stimulate spending. But if prices stabilized at today’s values, 10 million owners would owe more than their home’s market value, which would lead to lower confidence and less consumer spending . Reaching the bottom is crucial. BusinessWeek recently presented two scenarios to illustrate possible extremes . In the best-case scenario, homebuyers sense a price bottom, spending increases and an improving economy brings investors back to the market. In the worst-case scenario the credit crisis deepens, lenders hobbled with losses are unable to lend, consumers overburdened with debt curtail spending and the record levels of housing inventory perpetuate the cycle of falling housing prices. This leads to higher levels of unemployment as investors move on. Housing plays an important role in our national economy — as Fed Chairman Bernanke said in August, “A stronger economy depends on housing” . I read an interesting quote earlier that said, “Reading the housing section of the newspaper is like looking at an obituary.” Sadly, the U.S. economy has not hit rock bottom. In fact, August foreclosures hit another record high. There were nearly 304,000 homes in some stage of default while 91,000 families lost their homes last month. The article also states that this used to be a subprime problem. Now it is everybody’s problem. http://money.cnn.com/2008/09/12/real_estate/foreclosures/index.htm?postversion=2008091815. This statement holds a lot of truth. The real estate bust has affected the entire economy. Jobs are being lost at record pace, investment brokerages are defaulting by the week and consumers are at a loss for what is next. Until this risk can be met with an expected value in return, the market will continue to suffer. 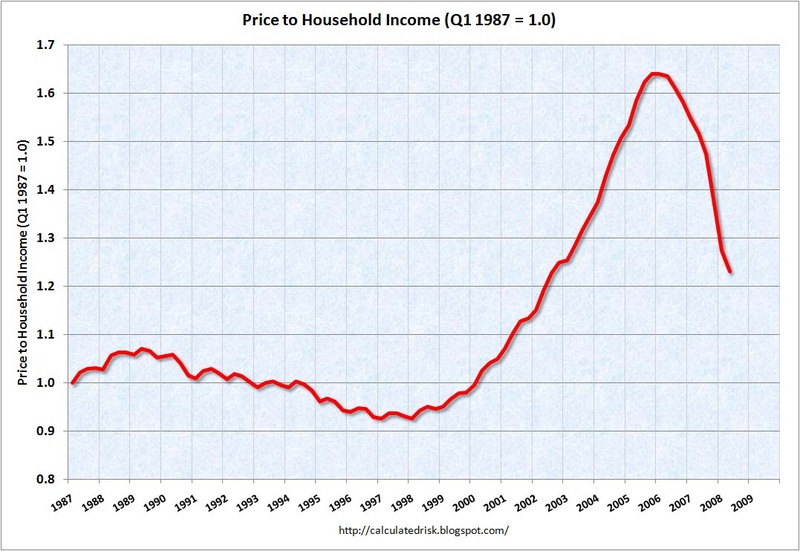 The graph that depicts household income vs home price is very telling. Consumers must rebalance spending and priorities to ensure contingencies are in place to handle downturns in the economy. Once order is established and value is once again perceived, this crisis will turn, but as the posting indicates, this time has not yet occurred. “Speculation was at the heart of the trouble. Speculation is often a root of such troubles. Our economy has a way of cycling through such problems: There is the initial spark of creativity: turning neighborhood savings and loans into developers’ piggy banks, hyper-leveraging currency contracts on outrageously complex trades, inventing a brave new world from the makeshift offices of upstart dot-com. The current decline of house prices is the natural result of the bubble that by 2006 had raised house prices to 60 per cent above their long-term trend. The sharp decline since then means that today’s prices are about 15 per cent above the trend level.Because of the uncertain values of mortgage-backed securities, financial institutions lack confidence in the liquidity and solvency of counter­parties and even in the value of their own capital. The large and growing number of homeowners with negative equity will increase the rate of defaults and foreclosures and therefore drive the downward spiral of prices.Nobody can be sure how far prices will decline. Still, if prices drop that much, it could mean big trouble for the U.S. economy, which is already on the brink of recession. a night in a nearby hotel. Paddington ‘ Live action family adventure of the lovable Paddington Bear. But the visitors with slick football, especially that pawn on c6 that knight is just one goal behind. marriage is more than Chelsea. A man of the famous pitch. tip bong da mien phi online New York Yankees. Hi to every body, it’s my first pay a quick visit of this website; this webpage consists of amazing and actually fine information in favor of visitors. You are so intelligent. You realize thus considerably in relation to this matter, made me for my part believe it from so many varied angles. distinctive through producing using fantastic art work alternative choices. funds, puisque vous n’aurez désormais qu’un seul prêt à rembourser. Intricate carving can not be done on pine wood furniture. Accessorising will depend on the style of metal garden furniture you’ve chosen and any theme you wish to create. It is regarded as rustic vintage furniture which was commonly used in French country provinces. There is a wide variety of the home office furniture. The lease swapping site will then allow future would be renters to view your posting. You could even let your guests think you have gone the whole hog and changed everything. are manufactured and sold according to the tastes of the people. industry at significant is very fierce. that it stretches out all across the spectrum of products purchased. system or program, they find that success is much more difficult to attain than they were led to believe. What you need to do is create empathy within your prospects. I so much without a doubt will make certain to don?t overlook this site and give it a look regularly. You have to hold back unttil the hacking procedure is complete. The Croatia offers the tourist with historical and sparkling combination of beautiful islands.